Sometimes mom needs a quick kid-friendly diversion—and when that diversion can double as snack or dessert preparation—it is all the better. I love to cook with the girls. Trying new recipes and ideas is a wonderful way to encourage even my picky eater of the three to try new foods and flavors. 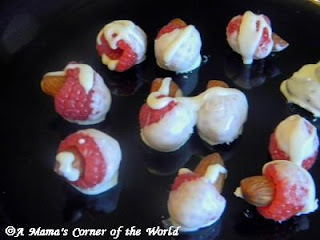 White Chocolate Dipped Raspberries Stuffed with Almonds was actually the creation of the resident Dad here in our corner of the world—and he is planning to have a few on his oatmeal tomorrow morning….if they last that long! Our middle little one is not an almond fan (except in a Hershey bar)—but, she is a chocolate fan and loves red raspberries. We opted to dip a few berries without nuts—just in case she did not like the final combination. Whole Roasted Almonds (enough to stuff the desired amount of raspberries) We opted to almonds because the shape is perfect to stuff into the center of a raspberry—and long enough to serve as a “dipping handle” for little hands! Prepare the berries. Wash and inspect each raspberry. Make sure that the berries are sturdy—squishy berries do not hold up well to chocolate dipping. Stuff each berry center with a whole almond. Try not to push the nut completely through the end of the raspberry—but, that’s easier said than done for some little ones! Melt the chocolate. Combine the shortening and the chocolate chips in either a mixing bowl for the microwave or in a heavy saucepan. Melt the chocolate chips, stirring until smooth. Dip and drizzle the berries. The girls used the almonds has “handles” for dipping the ends of the berries into the white chocolate. Place the dipped berries onto the wax paper lined cookie sheet. We then drizzled a little extra melted chocolate over the berries from the back of a spoon since some seemed a little light on chocolate! Chill until set. Chill the white chocolate dipped berries in the refrigerator until the chocolate hardens. Serve. I think these would be great on a buffet or as a snack. The girls ate a few as dessert atop vanilla frozen yogurt. As I mentioned—the Dad foresees 3-4 in his morning oatmeal. Oh--and the middle little one discovered that she DOES like almonds after all! Yum!! These look amazing! Perfect snack!